Dr. Herman is a native of Cambridge, Massachusetts and has been practicing oral and maxillofacial surgery in the Boston area since 1976. He has received degrees from McGill University in Montreal and the University of Pennsylvania in Philadelphia. He completed his oral and maxillofacial surgery residency at the Albert Einstein College of Medicine and Montefiore Medical Center in New York City. 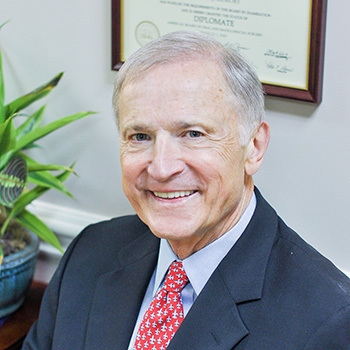 Dr. Herman is Board Certified and is a Diplomate of the American Board of Oral and Maxillofacial Surgery. He is also Board Certified by the American Dental Board of Anesthesiology and is trained and licensed to provide anesthesia services in an out patient setting. Dr. Herman is a fellow of the American Association of Oral and Maxillofacial Surgeons and the American College of Oral and Maxillofacial Surgeons. He has been a member of the Advisory Committee and the Examination Committee of the American Board of Oral and Maxillofacial Surgery and has participated in the delivery of the National Certifying Examination from 1990 to 1996. Dr. Herman maintains academic appointments at both Tufts University and Boston University. He is an Assistant Clinical Professor and participates in the education of both surgical residents and students at both of these institutions. He has also served as Chairman of the Committee on Residency Education and Training for the American Association of Oral and Maxillofacial Surgeons. Dr. Herman has served as a medical staff officer of the Caritas Norwood Hospital in Norwood, Massachusetts since 1989. He was elected as President of the Medical Staff in 1992 and 1993. He has also served as a member of the Board of Trustees of the Southwood Community Hospital in Norfolk, Massachusetts from 1988 to 1991. Volunteerism and the assisting of the needy in developing countries is a major focus of all of the doctors in this practice. Dr. Herman was one of the co-founders of the national organization Health Volunteers Overseas out of Washington, D.C. in 1986. He has also been a director of volunteer programs for the group “Healing the Children”. Both of these groups provide free care for patients with cleft lip, cleft palate and craniofacial deformities. The doctors participate in these programs on a regular basis and usually spend from 4 to 6 weeks per year in countries throughout Asia and Latin America. We are very proud of our staff and welcome all questions and comments with regard to their training and philosophy of health care.